A resource for collectors. Discussion and a comprehensive list. Byzantine Cherson (in Greek it is spelled with a chi, so its pronunciation is somewhat like "CARE son") was located where Sevastopol is now. Sevastopol is in the Crimea, Ukraine, on the peninsula projecting into the north side of the Black Sea. The ruins of Cherson cover a cape on the edge of the city and parts are under water. Ancient Cherson (destroyed by the Mongols-Tatars in the 13th century) is the one labeled with large letters - it is not the modern Cherson (founded 1779) labeled with small letters. The city is the "Tauric" Chersonesus as opposed to the "Thracian" Chersonesus at Gallipoli on the European side of the Dardanelles. In the Greek period, coins of both places are found under "Thrace," although in different subsections. 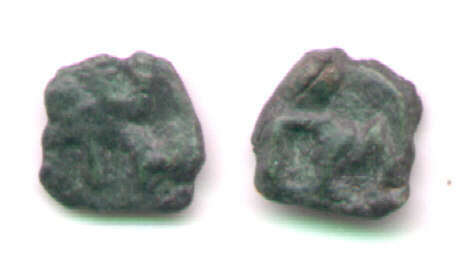 Cherson issued its own city coins beginning in the fourth century BC. For some of the scarce city coins of Cherson, see here. This site begins with coins of the Roman emperors Theodosius II (402-450) and Valentinian III (425-455). The list of Byzantine coins begins here. The distinctive "H" type: Legend XEP-CONOC ("Chersonos"). (for "8" pentanummia = the usual 40 nummia of a follis) to the right, cross above. The obverse legend names the mint city, but not the emperor, which is highly unusual. This type has been variously attributed to Justin II and Sophia (AD 565-578) or Maurice (602-610). The attribution is discussed at length below. What's new? 2018, Feb. 22: Examples of the famous "M", "K", and "H" types of Maurice, and an example of the only Heraclius "H" type. Jan. 7, 2017: Excellent examples of Theodosius II and Valentinian III. 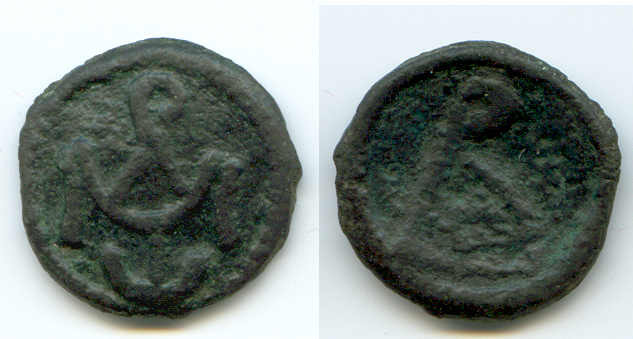 Excellent examples of Leo I, including one of better style with unlisted correct legend (ES4). Examples of city coins of Cherson. Nice "Delta" example of Justin II-Maurice. **** Above here, coins are struck. After here, almost all coins are cast. Format explained, color code, abbreviations, etc . 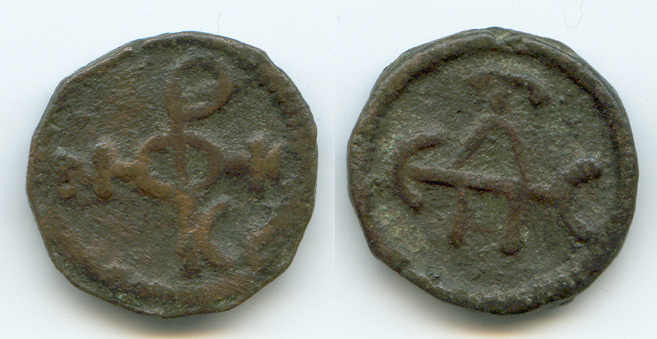 A few coins of pre-Byzantine Cherson. Introduction : Coins are organized chronologically by emperor and type. The primary reference is Anokhin. Sear is the secondary reference. Format, abbreviations, reference works, types, and color code are discussed below. Monograms are easy to find in the table itself. However, in addition, all monograms are listed in one place and linked to the table . To search this page, use the usual "Find" command: "ctrl, F" or, on a Mac, "cmd, F". To find a type by Sear number use "S" as a prefix with no following space, eg. S1772. Attributions by Sear (Byzantine Coins and Their Values) and the other major western references (Dumbarton Oaks, Grierson, Berk, etc.) frequently differ substantially from those of Anokhin. There are three main areas of controvery (The arguments are discussed below ). 1) Who issued the AE14-16 coins with VICTOR reverses? Excellent examples show at least "IVSTIN ...." Some legends are clearly of Justinian. The question is if any are of Justin. Some legends are short enough for Justin, but those seem so blundered it is not certain they intended to say "IVSTINVS" instead of "IVSTINIANVS." 2) Who issued the "M" and "H" folles and "K" and "delta" half-folles with legend "XEPCONOC"? 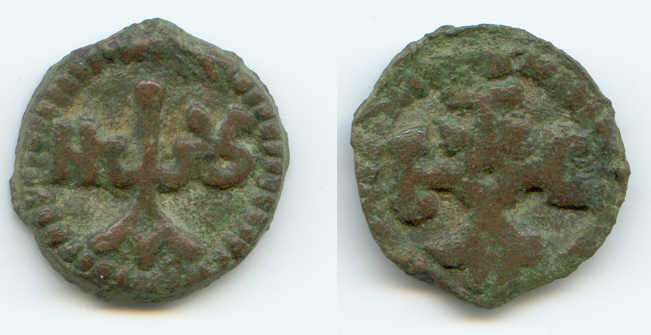 Very similar coins were issued in the name of Maurice, so older attributions of the "XEPCONOC" types were also to Maurice, but now some scholars have argued that they were originally issued by Justin II. 3) Which of the several types with monograms of "Romanus " belong to which of the four emperors named "Romanus" ? For arguments about attributions, see below. Color Code: The table uses green to indicate that the reference in green (usually Sear) attributes the types differently than I have in these tables. For notes about references to Sear, see below. Struck or Cast ? 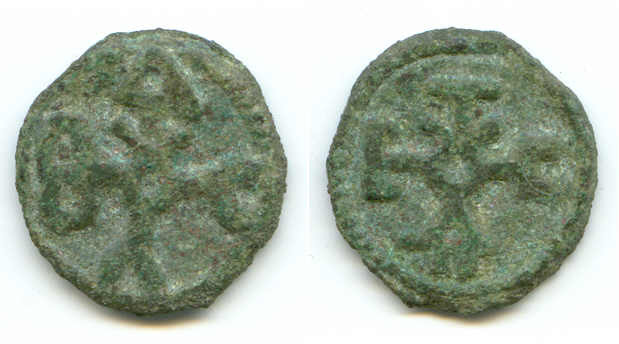 Coins from Cherson from the 5th century through Constans II (641-668) were struck. Their fabric, if not their designs, resembles normal Byzantine coin fabric. After a long gap in production, coinage apparently resumed at Cherson in the late 8th century with crude cast (not stuck) coins imitating earlier types. Coinage attributable to a particular emperor resumed with Theophilus (829-842) and from then on most types were cast. The fabric of the cast coins of Cherson is distinct and unlike that of other contemporary series of coins. RIC X, p. 92: "As with the AE2 of Leo and Zeno, provenances imply that this denomination was struck at Constantinople specifically in Cherson and its hinterland." NC 1995 notes that there seems to be no exception to the provenances being the region of Cherson. [Hahn does not cover Valentinian III.] Valentinian III's pieces are rarer, which is not surprising this far east because he was the western ruler. These and the Leo pieces have a mintmark of Constantinople in exergue: CON or CONE. NC 1995 suggests (but does not assert) it should be believed. Anokhin does not attribute any coins of Theodosius II, Valentinian III, or Leo I to Cherson. However, if they were not actually struck in Cherson, they were certainly associated with Cherson in that they are found in the region of Cherson and generally not elsewhere. Hahn calls these pieces "maiorina." Anokhin attributes this type to Cherson. The region of Cherson is the provenance of finds. The flan is usually too small for the dies. So. 1.13-14 S112C B-- This has a short, blundered, obverse legend. See ES11 for the same type with a longer legend. A326 is a later cast of this type. Sear gives all three VICTOR types to Justin, and the third type also to Justinian, as listed in these tables. Anokhin gives them all to Justinian. Many examples have a legend short enough to be Justin, but none are clear and sensible all the way to the end of the legend. The three types above are associated with shorter obverse legends and therefore given to Justin. 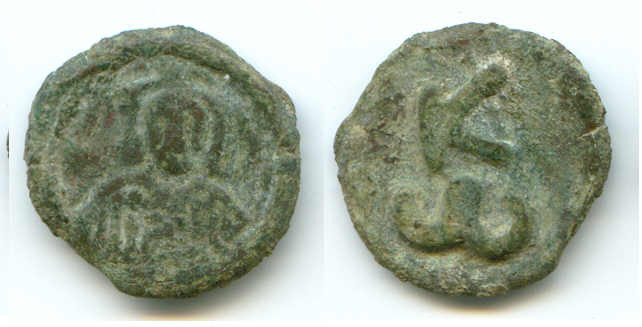 When a VICTOR piece has a long obverse legend definitely showing enough letters to be attributable to Justinian, it is type ES11, with emperor holding a globe. Sokolova attributes examples of "emperor holding a globe" with a short, blundered, obverse legend (ES9), to Justin I, and very similar examples with slightly longer blundered legends to Justinian I (ES11). Sear has the same distinction. Without any confidence in them, I have chosen to reproduce these attributions here. If these three types were not given different Sear entries, they would probably be regarded as one type with three minor variants. For the arguments supporting the various points of view, see below . = A310 Hahn (2000): "one die .. a thoughtless copy of the solidus legend." (pl. 29, p.157f) See also ES9. "second half of 8th century"
Anokhin gives all the VICTOR types to Justinian I (See the reasoning below ). Hahn ascribes some to Justin I (518-527). Sokolova attributes some VICTOR types (ES7-9) to Justin and some also to Justinian (ES11). Even her Justinian pieces have short, blundered, legends and I cannot tell how he distinguishes ES11 from ES9 in the coins she illustrates. ES11 is often larger, less blundered, and has more letters. Here, the intention is that coins with long obverse legends indicating Justinian will be ES11; short legends with barely enough letters for Justin will be ES9. 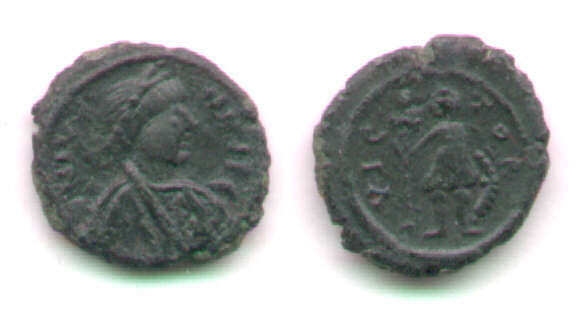 Justin II and Sophia (565-578). Images . 297.1-2 The M type with legend of Maurice, Sear 604, does not exist. Sabatier's line drawing of this type with legend DNMAV.... for Maurice, reproduced in Sear, has been proven by Sidorenko to accidentally combine drawings of two different coins. Justin II G-- (298) Sear 609, this type with legend DMMAV... does not exist. Sear 605 and 606 are very similar. There are examples of nimbate and cross/not nimbate. See below . Hahn does not give any Δ pieces to Tiberius II. Anokhin assigns the varieties (ES13-16) with XEPCWNOC to Justin II, instead of the older attribution to Maurice used by Sear. Anokhin assigns only those with DNMAVRIC PP AVG to Maurice. Grierson does not outright deny it, but has his doubts. Hahn assigns the XEPCWNOC coins to three emperors: Justin II, Tiberius II, and Phocas. For the arguments, see below. The types with M and K (S604, S609) in the name of Maurice probably do not exist. No modern author has found an example. Old citations and the Sear line drawing are all from one source, Sabitier, who accidentally combined images of different sides from different coins. Anokhin has no example and the DO number for ES13 is in parentheses "(302)", which means they have no example. The obverse legend for Maurice is given in references in an ideal form: DN MAV-RIC PP AVG, or something similar, however the coins themselves may omit letters and the delta type omits several. Sidorenko argues that the types in the name of Maurice above and the next two below were actually minted at Bosporos, the modern city of Kerch, and not Cherson. Kerch is on the very east end of the peninusla (just below the "Z" of "AZOV" on the map above). Sidoranko's argument is that almost all the documented finds of these types (ES17-20) have been in Kerch and not Cherson. Also, he, and others, interpret the "B" in "K B" of ES20 as "Bosporos" (and the "K" is for "Constans"). DO 311 is this type with a Herclius countermark, Sear monogram 32. Sear: "The obverse of this coin is sometimes countermarked with the Heraclian monogram 32." So are Sear types 605 and 606. Hahn (NCirc, 1978) knew of only 3 examples. He is certain that it has "KB" and not "XB" as Morrison read one example. The example here is much clearer and makes it certain. In 2007 Sidorenko was able to illustrate 15 examples. If it is from Cherson or Kerch, it is their last major die-struck type. Almost all later coins are cast. However, recent arguments convince me this type was struck in Constantinople and shipped to the Crimea. It is quite similar to regular Constantinople types (such as Sear 1011 and 1014) and not at all similar to other types undoubtedly from Cherson. After this type, there is a long gap until the late 8th century with no coins from Cherson. The next type attributable to a particular emperor belongs to Theophilus. So6.4-5 S-- B-- G-- DO-- A much reduced size, crude cast imitation of types ES17 & 18 of (Justin II) and Maurice. Hahn (1978) said only 3 were known. Sidoranko illustrates 3 on his plate I.
So.6.6-11 S-- B-- G-- DO-- A: "late 8th-early 9th century"
There is a cast imitation, A326, of the "VICTOR" type, ES9 above, which Anokhin gives to the "second half of the 8th century." 13mm A331-332 S-- B-- G-- DO-- A: "emperor". A332 may have a small B to the right of the M. This type is struck, not cast. 14mm A333-336 S-- B-- G-- DO-- A: "Protevon". This type is struck, not cast. 14mm A337 S-- B-- G-- DO-- A: "Archont". These 3 are the "first series" of Michael III. This type is struck, not cast. 15.1,2,3 The next two are this type, but with order of the letters switched on the obverse (E8/7) and on both sides (E8). G, page 187: "AD 866-867"
The ill-cast A344 may lack the reverse "o". So6.14 S1701 B--- G865 (14) This type is struck, not cast. DO: "class 1, 860-866" p.469. XXXV (4) This type is struck, not cast. garbled ? A350 S-- B-- G-- DO-- This type is struck, not cast. Small "early 9th C." One unclear piece. Sokolova gives the "MB" piece (E7) to Michael III and Basil I, AD 867, but does not list the "BM" piece (E8). 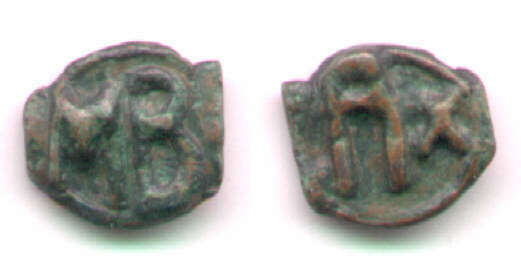 Basil I "B", but the reverse is garbled. A 13 mm example is (perhaps) unpublished. 17.a2-3, 17.c A353 is struck., but similar in design to these. So.7.12 S1719v1 B911 G870 DO 20a.3,.9 A370 and So7.8 do not have pellets beside the cross. So7.16 S1719v2 G-- DO-- So7.16 has no clear dot in the B. The cross is wider than E16. So7.13-15 S1719v3 G871 DO 20b.1-3 Similar to A360 above, but with pellets. loop is almost a delta. The top is not quite closed. So.13.8 S-- B-- G-- DO-- Anokhin "9th century", listed right after Basil I. There are various shapes of "B", from an almost modern "B" to a delta-shaped lower part. They also come with and without pellets on either side. A386 lacks dots beside the cross. Con VII B940v1 G-- DO-- Anokhin has these letters with dots for Con VII while he was assoc. ruler 908-912 (That is why E22 is here rather than below.) See E23, next, for the obverse without dots during his own reign. Sear distinguished E22 and E23 in the first edition, but not the second. The coins with "A" that Sear lists as "Alexander" are listed here under Michael III as Archont, as attributed by Anokhin. 29.1,29.4 See E22 above for similar type with dots. So9.1-2 S1763 B932 G877 28 Sear says "Con VII/Zoe" (914-919), as does Sokolova. A says "Con VII/Helen"
for Romanus and Christopher, putting all four on one coin. pl. XL P sometimes (usually?) retrograde, as in Sear's photo, and A409-410. cf S1764 B-- G-- DO-- Small size. Resembles E44 but much smaller. Note: The monogram and the monogram previously attributed to Romanus I are given by Anokhin to Romanus IV and Romanus III, respectively (below). Basil I B--- G868 DO 18, pl. and a slightly variant reverse, but I see it as a miscast coin of this type. Sear does not attribute any coins to Cherson after Basil II, S1814. Sokolova attributes all the and monogram pieces as "anonymous XI-XIII century" (p.143 and plates 12-13). Anokhin cites conclusive hoard evidence to prove that these "rho-omega" types must be XIth century or later. The timing and monogram apparently fit Romanus III. He convinces me they can not be of an earlier Romanus (I or II). However, I see no reason to assume that the next, slightly different, monogram should be attributed to Romanus IV, skipping thirty years and several reigns. I prefer the caution of Sokolova. 34.1-2 pl.XL This resembles E39, merely with a different version of the rho-omega. LD G881 32.a1-2 The cross is usually weak. It may be that some pieces said to be "weak" are really blank, as A468-480 below. See E30 for a smaller piece. XL: 33.2 A476-480 have somewhat reduced size. This type is usually attributed as A456-467 with a very weak reverse. A = Anokhin, The Coinage of Chersonesus, IVth Century B.C. - XIIth Century A.D., translated into English by H. Bartlett Wells, BAR International Series 69, 1980. This is a rare book which translates the Anokhin above. In attributing the coins to various emperors I have made some judgements about the arguments put forth in this book. This affects the attributions of types that Anokhin gives to Justin II and other types he gives to Romanus IV. Note: Many Berk types are identified only by Sear number, which can be misleading because they are numbers from the first edition of Sear, which sometimes differ by 1 from those in the second edition. Here is a concordance between Sear's second edition and his first . Bridge, R. N. "The Coinage of Chersonesus," a review of Anokhin's book (above) in Numismatic Chronicle, 1981, pages 183-187. A very good scholarly review which mentions alternative views of others on numerous controversial points. Note: Parentheses around the DO number, e.g "(210)", means they did not have an example and the illustrated coin is from another source. H,NCirc = Hahn, "The Numismatic History of Cherson in Early Byzantine Times--A Survey," Numismatic Circular (1978) pp. 414-5 in September, pp. 471-2 in October, and 521-3 in December. MIB III = Hahn, Moneta Imperii Byzantini, Volume III "from Heraclius through Leo III (610-720)" in German. 1980. Numismatic Chronicle , 1995, p.271-5 and plate 48, 2-3. Here is a summary of their comments about the mint . S = Sear, Byzantine Coins and Their Values, second edition, 1988. Sear is the most common reference for Byzantine coins, but not the most up-to-date for coins of Byzantine Cherson. All monograms are drawn on his page 32. The Sear numbers given here are second-edition numbers. Here is a concordance between Sear's second edition and his first . Here is what the ANS has (an edited page of search results, used with permission). J. C. Carter, Crimean Chersonesos: City, Chora, Museum and Environs (2003). This is a beautiful book on the ancient city and artifacts recovered from it. The archaeological site was a well-kept military secret from many years because it was at the site of the Soviet naval base for the Black Sea fleet. Unfortunately, the book has very little to say about coins or about the time period as late as Byzantine Cherson. Of course, there are the standard Byzantine history books by Ostrogorsky, Vasiliev, the Cambridge Medieval History, and the recent enjoyable volumes by John Julius Norwich. However, none of these have much on Cherson. Sear number suffix v1 or v2 distinguishes two Anokhin types with the same Sear number. For example, Sear does not distinguish between and , but Anokhin does. Sear has some photos, some line drawings, and some coins without either. Those Sear numbers (which are second edition numbers) with photos are in bold, those with line drawings say "LD". Click here for a concordance to first edition numbers . To search this page for Sear numbers, use "Ctrl, F" and "Sxxxx" (with no space between the "S" and the number). v1, v2 = suffix on Sear numbers to distinguish two Anokhin types with the same Sear number. For example, Sear does not distinguish between and , but Anokhin does. Sear or Berk number in bold = illustrated with a photo. Coins are listed by type. This lists all the intentional types, but not all the varieties, issued at Cherson. "Types" are regarded as coin designs that were intended to be different by the issuing authority. "Varieties" are minor variants on what was intended to be the same design. The distinction between "type" and "variety" is always subject to question -- we cannot know what was in the minds of the authorities over 1000 years ago. Therefore, in cases of close calls, I have selected in favor of different "types" if and only if I think modern "type" collectors would have good reason to think something in the design was intentionally changed. In some cases I have used a different criterion. For example, when a legend is retrograde it is doubtful a new type was intended, but the interest for collectors is sufficient to list it as a different "type." In the case of Sear 197A-C (Justinian I / VICTOR), the three similar varieties have been listed as three types because Sear did so. Types, diameters, and weights. A "type" may exist in several minor variants, varying both in design details and diameter. But even more variable are the weights of cast pieces, because the the preparation of weight-adjusted flans is not part of the minting process. The process of casting does not lend itself to accurate weight adjustments. The typical diameter in millimeters of each type is given in the left column in black. Coins listed in the order of the Anokhin numbers . Russian scholars have reattributed many types since Sear was published in 1988. Anokhin's order and attributions are probably preferable to Sear's. When Sear lists the coin under a different emperor than Anokhin, the Sear listing is in green . Also, Anokhin has determined that some differences regarded as "varieties" by Sear actually distinguish significantly different types. When a single Sear number refers to two or more types distinguished here, it will be followed with "v1" or "v2" to distinguish significant varieties. Obverse/reverse. If coins are slightly bowed, the obverse is taken as the convex side. This usually is the side with the monogram of the emperor. Therefore, on essentially flat coins, the side with the monogram of the emperor is treated as the obverse. This is not always in agreement with Sear or other references. To find a type in the list, if you don't find the "obverse" in the obverse column, look for it in the "reverse" column. Monograms. Most monograms are of the emperor's name. The other monograms are listed first. "Archont" (according to Anokhin, but "Alexander" according to others. All place it under Michael III). (Some appear twice, or more, in the table. The link is to the first appearance). "Basil II and Constantine VII"
Return to the list of, and links to, emperors in the tables . Comments on history, coins, dates, and attributions. 1) Who issued the AE14-16 coins with VICTOR reverses? Anokhin gives all "VICTOR" types sometimes attributed to Justin I to Justinian I (that is, all three of S112A-C, which Sear gives to Justin). Hahn claims the legend of H77 is clear and of Justin I. The legend in his picture does show a crude DNIVSTINV.... However, its blundered termination does not inspire confidence. 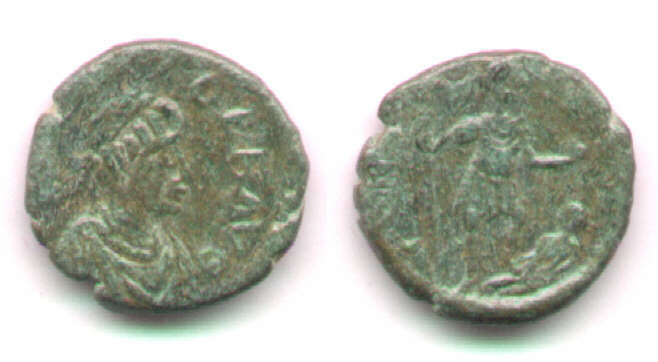 In contrast, some VICTOR coins with cross and globe (ES10) do spell IVSTINIANVS correctly. For Anokhin the type ES9, which is apparently a unique piece, is the original prototype from which all the others are more or less degraded copies. 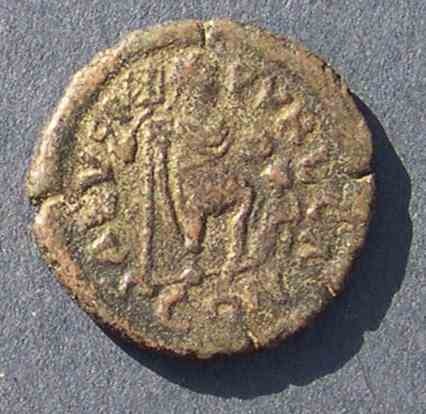 On this one coin the name IVSTINIANVS is said to be legible (but it is not clear on the published photo). If so, and if you accept the usual progressive decline in size and artistry, then the other VICTOR types must follow and therefore be of Justinian also. However, Justinian did reform coins and increase their sizes, and type ES11, generally accepted as later, is reasonably well executed and certainly not as crude as most of the VICTOR types. Hahn (1978) notes that Procopius mentions that the Bosporus submitted to Justin I. This would be a good reason to expect coins of Justin I.
Hahn, plates 11 (Justin) and 29 (Justinian), gives "shields" to Justin and "globes" to Justinian, with the exception of Justin 78 = A311 (same coin), a "globe", which is not at all clear, given to Justin. Sokolova illustrates several "long cross and globe" with short, blundered, obverse legends. In any case, the majority of pieces of types ES7 and ES8 have short obverse legends (not clear all the way to the end, though), and the majority of pieces of ES10 have longer obverse legends. Therefore, I have tentatively given, without confidence, some of the "long cross and globe" type to each (ES9 and ES11), and the others (ES7 and ES8) with a short obverse legend to Justin. 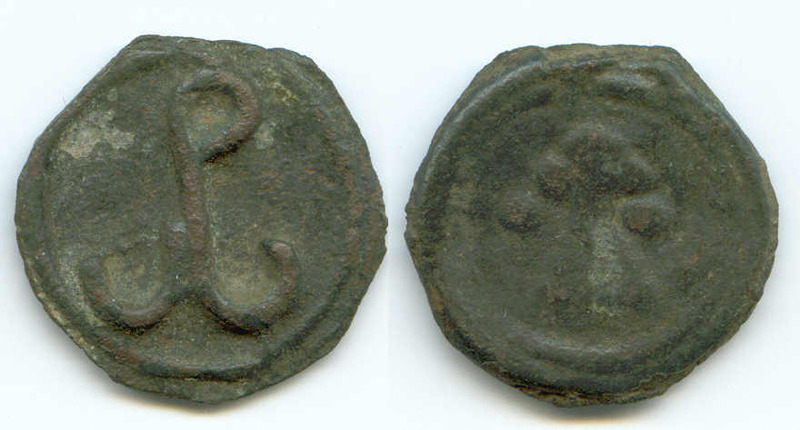 2) Who issued the "M", "K", "H" and "delta" follis and half-follis pieces with legend "XEPCONOC "? 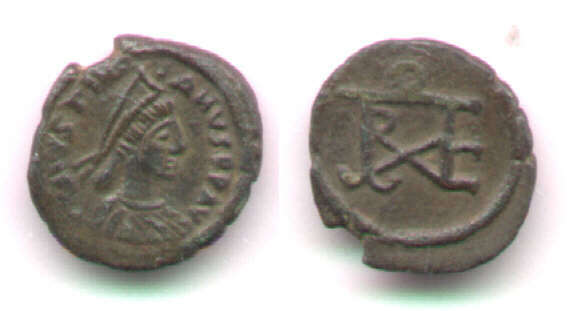 Very similar coins were issued in the name of Maurice, so older attributions of the "XEPCONOC" types were also to Maurice, but now some scholars have argued that they were originally issued by Justin II. 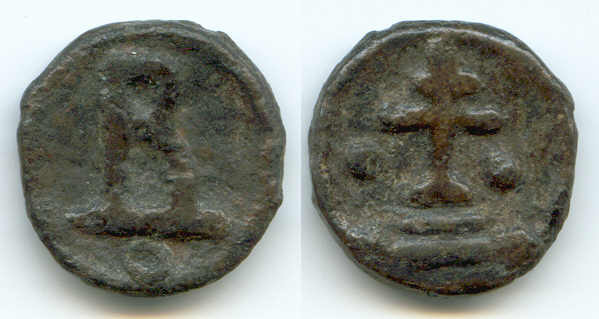 Under the old attribution the obverse figures are Maurice and his wife and the reverse figure is his son Theodosius. 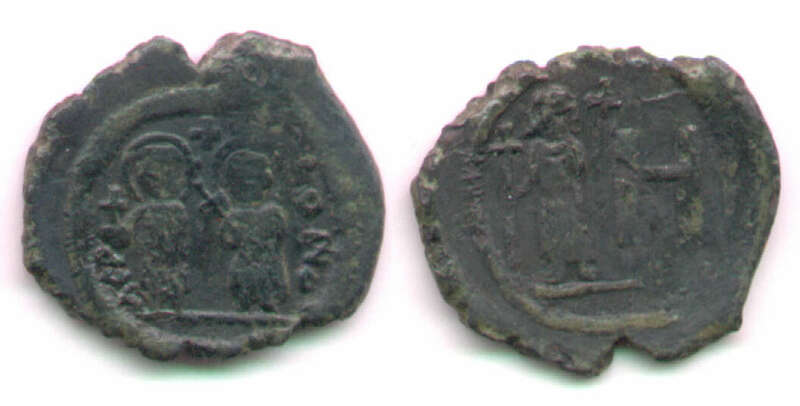 Grierson (p. 73) says, "If the coins all belong together it would seem reasonable to regard them as an insurrectionary coinage struck at Cherson in 602, the intention of the rebels having been initially to depose Maurice in favor of his son Theodosius and not the upstart adventurer Phocas." According to this theory, the revolt prompted a new coin with a neutral legend, which was replaced by the emperor's name when the outcome favored Maurice. This attribution is accepted by Sear. Anokhin (1980) and Hahn (1978) concur that Justin II initiated the type and it continued in the following period. Anokhin argues the two-figure type resembles the regular type introduced by Justin II and Sophia. 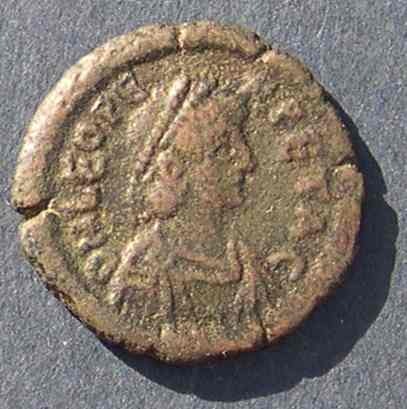 However, a type can resemble one of Justin II and be issued a few years later. Anokhin says (p. 92) "if the striking commenced from the moment Theodosius was named Augustus, i.e. in 590, all three series with differing types would have had to be issued within limits between 590-602, which is unlikely." [Why is that unlikely?] Hahn also argues that there are several minor varieties which would probably take a number of years to mint. However, the varieties are clearly very similar (see the page with the "H" types) and not numerous. We know that mints can make huge numbers of coins rapidly whenver they are directed to and have metal. There is no need to postulate more than ten years to mint three very similar types, all of which are scarce. Anokhin (p. 92) argues "if we assign the coins described to Maurice we expose their failure to correspond with empire-wide coins, which have on the obverse a portrait of Maurice alone." But that argument is feeble -- we know Maurice minted such coins that fail to correspond with empire-wide coins -- some of the coins we are attributing have his name on them! All the arguments of Anokhin are very weak. Anokhin (p. 93) thinks the reverse figure, if a real person, could "be Tiberius, the future emperor, who was proclaimed Caesar in December 574 and who reigned as co-regent jointly with Sophia during the last four years of the life of Justin II who was mentally ill." However, he does not accept that it is a real person and says "it most likely represents some symbolic figure or a saint." Hahn notes that the reverse figure seems to be a Caesar (because the pendillia are lacking) and says in the later 6th century the only appropriate Caesar is Tiberius II under Justin II. However, the older attribution already had an acceptable Caesar, the son of Maurice. Hahn notes the first issue, with the "M" and "K" has an omega, ω, in "XERCωNOC", rather than the later "O". The "H" and delta pieces have "O". Clearly, the "M" and "K" are the first of the series. However, that does not make them issued by Justin II. 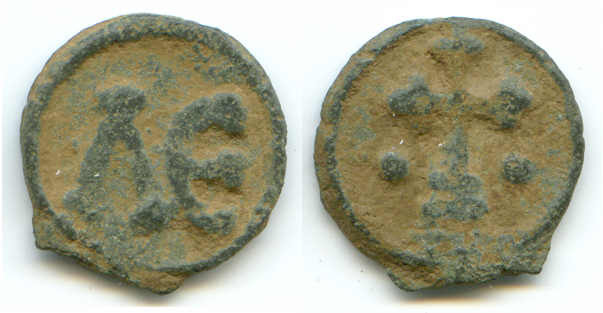 Hahn admits, as noted by Grierson, that the two-figure type is very similar to some coins of Focas (Phocas). If we want the "H" issues to be continuous they could equally well be at either end of the potential attribution period. Hahn gives the attribution to Justin II and calls it "secure." I think it is far from secure. It may well be that the "M" and "K" types began under Justin II, but the Hahn paper presents no convincing evidence. The dates of the Byzantine emperors to whom Hahn attribtes some "H" pieces are: Justin II 565-578, Tiberius II Constantine 578-582, Maurice 582-602, and Phocas 602-610. If you think the type resemblance of the "two figures" obverse to Justin II obverses is enough to attribute the earliest M and H pieces to Justin II, it is difficult to explain the omission of imperial names other than Maurice. Hahn (volume II) fills the gaps by also giving "XEP..." H examples to Tiberius II and Phocas (as well as Δ pieces). What is the criteria by which they differ from the other "XEPCONOC" coins? Why would the mint issue H coins without the emperor's name, then use the name of Maurice, and then return to omitting the emperor's name? The pieces seem indistinguishable! This type of lack of continuity usually is used to argue that a chronological arrangement is wrong. I can not read Russian so I cannot follow the reasons for the attributions of Sokolova. The four illustrated "H" pieces with legend of Maurice all have a cross between and above the two figures. Some of the "H" XEPCONOC pieces have a cross and some do not. But some of each are given by Sokolova to each emperor. Plate 3.4-5 (without) are given to Justin II but 5.6 (without) is given to Maurice. Whereas, 3.6 (with) is given to Jusin II, but 5.3-5 (with) are given to Maurice. Anokhin's argument is, in my opinion, very weak. I do not find the arguments for the reattribution away from Maurice compelling. Therefore, I have used the older attributions in this table -- the ones used by Sear. Perhaps I am missing something convincing. I think an obvious question is "Why was the emperor's name omitted and the name of the city put on the coins where the emperor's name always went?" Grierson attempted an answer and made it primary to his attributions. The attribution to Justin II seems to be based on the type alone and incorrect concerns about the volume of coinage and very minor varieties. Why would a two-figure type be under Justin II? I agree that *if* Justin II were to mint at Cherson, he would probably have used a two-figure type (but, with his name). However, we are interested in the converse which is not logically equivalent. "If there is a two-figure type, is it of Justin II?" First of all, let's be clear the H two-figures are not the same two-figures of Justin II and Sophia coins. Those are seated and the H types are standing. Assuming the H type copies another established type (Why should we assume that? The H itself does not, and the reverse is much different! Couldn't this be the innovative type? ), it implies the other type must have been earlier. Types before Justin II did not generally have two figures, so coins of his reign are the first possible prototypes, but two-figure (or three, it you count the reverse) could have been used for anyone later. *If* the figures are particular actual people, why are they not named? If we do not care if they are actual people, then the two-figure type could have been used at Cherson by anyone later including Tiberius II or Maurice whose usual copper types have the emperor alone. Hahn now gives some, without conviction, to Tiberius II (to bridge the gap from Justin II to the certain Maurice) and to Phocas who is still later but did use a two-figure type elsewhere. So, I remain unconvinced the "H" type was initiated by Justin II. The arguments that it belongs to the regin of Maurice are stronger. Whitting (p. 181) says Cherson was transferred to Prince Vladimir of Kiev in 989. This would serve as an explanation for why Byzantine coins of Cherson were thought to end with Basil II who reigned AD 976-1025 (Sear 1814). Some coins that used to be attributed to Romanus I are now attributed to the later rulers Romanus III and Romanus IV. Anokhin cites conclusive hoard evidence to prove that these "rho-omega" types must be XIth century or later. The timing and monogram apparently fit Romanus III. He convinces me they can not be of an earlier Romanus (I or II). However, I see no reason to assume that the next, slightly different, monogram should be attributed to Romanus IV, skipping thirty years and several reigns. Even if coins really were issued by Romanus III (1028-1034), why are there no coins attributed to any of the half-dozen rulers between Romanus III and Romanus IV (1068-1071)? A glance at the types now attributed by Anokhin to these rulers shows they are quite similar, merely with variant monograms. Agreeing with Sokolova, I would attribute the first type to Romanus III and assert nothing stronger than that the other late "rho-omega" types, both large and small, are as late or later. I am ignorant of the arguments that justify switching attributions of some Romanus I and Romanus II coins. Here, I have merely accepted Anokhin's attributions. Links: Coins of Cherson were issued as early as the 4th century BC. Here is an on-site link to some of the scarce ancient coins of Cherson issued before the Byzantine period. Here are several, illustrated at the site of the Odessa Museum of Numismatics. This is the end of the main page on Byzantine Coins of Cherson (Kherson). Go to the main Table of Contents page for this educational site.